"This is the way my Dad cooked summer squash on the grill. I have modified it a bit over the years, but it continues to be a tasty-easy no-mess way to cook yellow squash and zucchini on the grill to go with your burgers, steaks, or pork." Preheat an outdoor grill to medium heat. Cut two sheets of heavy duty aluminum foil, each approximately 18 inches long. 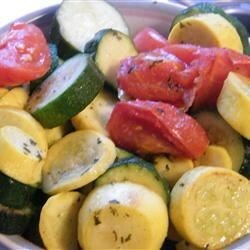 Place the yellow squash, zucchini, tomatoes, onion, and garlic in the center of one sheet of aluminum foil. Drizzle with olive oil; season with salt and pepper. Place second sheet of foil on top of vegetables. Fold edges together tightly to seal packet. Place packet on the top rack of the preheated grill. Cook for 15 minutes. Turn packet over and continue to cook until vegetables are tender, 15 to 20 minutes. Carefully cut an "X" into top of packet and pour vegetables and juices into serving bowl. Garnish with parsley. For a spicier option, add 2 tablespoons of red wine vinegar, 1 tablespoon of oregano, and 1 tablespoon of hot sauce (I use Franks® Red Hot®). This adds a slightly different color along with a robust flavor to the squash. A very healthy low fat side dish that's perfect for the grill! I add a little italian seasoning leave out the olive oil and just add some parmesan cheese right before serving. We added these to the grill today and they were absolutely delicious...very easy and healthy! I made this using butternut squash and it was a breeze. No fuss no muss. I did add more seasonings and the whole family went back for seconds. Thank you! I found these to not have much flavor. Very good, added asparagus to it while also sprinkling some garlic powder and onion salt on it. Turned out real good.